6" solid support core plus 2" sculpted made from 100% natural latex rubber (NO blends) covered with organic cotton stretch-knit matelasse fabric and quilted to therapeutic wool as a natural fire barrier (no FR chemicals). Our stretch knit allows you to feel the wonderful supportive recovery and contouring benefits of the latex. 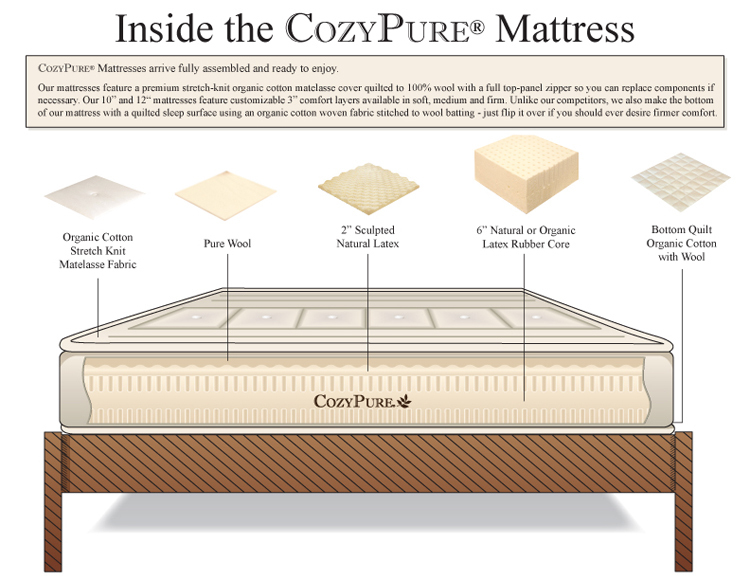 Our mattresses feature a zipper so you can easily change the comfort of your mattress. Quilt pattern may vary from photo shown. Total of 9" in materials (latex plus quilting). After compression and assembly, finished height of mattress is approximately 8.5" to 9.5" in height. Due to natural materials, exact dimensions are impossible to guarantee, and may vary slightly.